On average L2L students scored 53 points higher at the end of the school year compared to non L2L students, and increased rate of improvement 26% to 66% dependent upon student use. 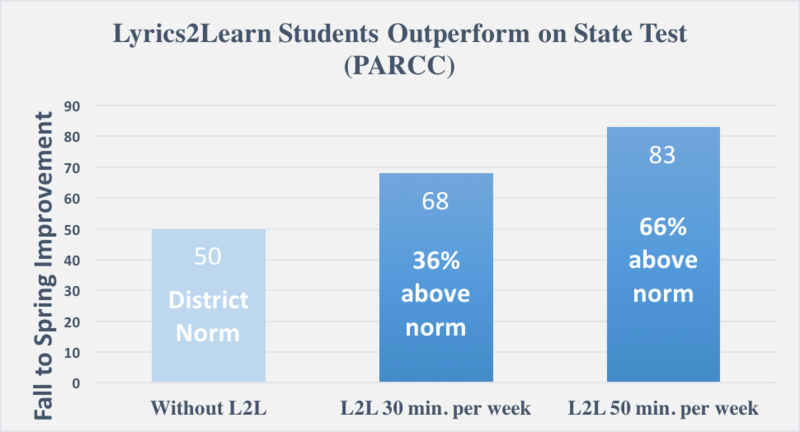 L2L students increased CMAS/PARCC scores significantly in 2016-2017. On average, L2L students were 53 points higher at the end of the school year when compared to non-L2L students. L2L students who completed at least 100 lessons over the course of the year were more likely to be considered ï¿½Meeting Expectationsï¿½ on the DIBELS by the spring of 2017. L2L students completing 100 or more lessons over the school year experienced, on average, a gain of 83 points from fall 2016 to spring 201. Over the same time frame, non-L2L students gained 50 points. "I think that this is the best program that I have used in my 17 years of teaching. I absolutely love it." "I like that it is so user friendly and that students are so engagedï¿½as a busy teacher...it is easy for me to check the progress and hold kids accountable. I like that students can be engaged in an effective program that provides them with relevant practice instead of worksheets or seat work."